Loc: 684 AB4. Don't miss your opportunity on this item; if you decide to buy later it might be gone! Style: High Rise Ankle Skinny. Ankle laid flat: 5”. 66% cotton, 32% polyester, 2% spandex. Rise: 9.5”. Ultra stretch comfort. Machine wash cold. Color: Blue. Style #: MY1466. Style: High Rise Ankle Skinny. Ankle laid flat: 5”. Jeans have a unique pattern and may vary slightly. Super soft ultra stretch comfort. cotton, 3% spandex (exclusive of decoration). Inseam: 25”. Split frayed cuff. Zipper fly with button closure. Superior stretch. Machine wash. 5 pocket styling. It may show signs of use such stray threads, marks or imperfections. Good used condition. Shows fading and wear consistent with light to regular use. Style: High Rise Ankle Skinny. Ankle laid flat: 5”. Superior stretch comfort. 99% cotton, 1% spandex. Color: Gray. Machine wash cold. Style #: MY1450. 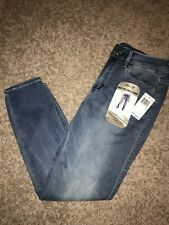 Up for sale, this EXCELLENT pair of ladies NYDJ "Ankle" stretch jeans in size 4. Made of 98 % cotton and 2% spandex. Made in the USA. The jeans have a cute curved hem (see 2nd pic). rise: 9 3/4". They are very nice looking with no sign of wear and tear or holes. They have a double button front closure along with a zip closure. The color and style of top you choose to wear with these jeans really has no limits. Skinny fit. Inset crochet details. Ankle length. FIT & SIZING. The product should be in original condition. IMPORTANT . Machine wash. Scalloped hems with eyelet accent. 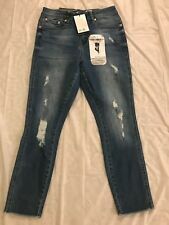 Anthropologie Essential Slim skinny jeans. Cranberry red fall color, leather trim pockets, trouser style skinny fit. Curvy through the hips, slim and straight through the legs. Excellent condition. Very minor wash wear/fading. Zipper & button closure & 5 pockets. Rolled up leg cuff is permanently fastened. Cute and durable. • Across bottom of leg at hem (while laying flat) 7.5". Size:4 x 25. There will be no exceptions made to this policy. Very nice back pocket detail. They have a nice stretch. They have a zip fly. They are in good condition. I do not receive any of the fees they collect. MATERIAL : Cotton / Spandex. LENGTH 33 in. WAIST 30 in. Ann Taylor Jeans. The size is 27/4. Isaac Mizrahi Live! Style/model: A307990. Intimates & Sleepwear. Athletic Apparel. Material: Denim. If you do not see the accessory in the photo, it is not included. Features: Skinny leg style, pockets, trim detail. Michael Kors Skinny Leg Pants Size: 4 Color: Light Khaki Inseam: 25” Small stain on back leg of pants. Item is preowned and all efforts are made to note any significant flaws. Leg opening 6.5". Hip 18.5" across. prAna Women's Cumin Yellow to White OMBRE Capri/Crop Ankle Zipper Jeans; Size 4. Style #W4JETT115. 75% organic cotton, 23% polyester, 2% spandex. 5 pockets, stretch, ankle zippers and fancy buttons and rivets. Excellent pre owned condition- no stains, holes, or signs of excessive wear. (Shadows may appear in the photos due to lighting issues- they are not stains!) Measurements are approx (laying flat): Waist: 14” Inseam: 25" Front Rise: 7.5” Hip: 18” Ankle Opening: 5.5" To get an idea of how these may fit you, I suggest using these measurements and compare them with a similar pair you already own. Shipped from a smoke free home! Color: Gail. Cropped flare hem. Size: 27 | 4. Its collection takes inspiration from a French way of "dressed up casual" embodied by the style icons of the 1970s. Material: 93% Cotton / 5% T-400 / 2% Elastane. Slim Crop Jeans. Color: Distressed. Thick Stitch. Leg Opening 6 1/2" (Across Front). Rise 7 1/2". Wonderful long capris - rise sits just below the waist & hem is just above the ankle. Machine washable - tumble dry. Inseam - 24.5". Waist - 28". GUC but has one distressed spot all the way through, as pictured. 99% Cotton and 1% Spandex.